Do you have the names of those conniving Tintypists who seek to ruin a fine mustache by placing the grower off-centre in the portrait? I should like to damn them all the way back into the depths of time. 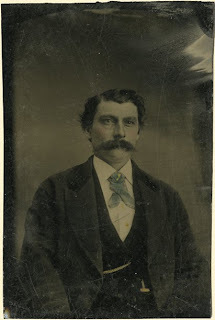 What a fine specimen of mustache! Lovely cravat as well, quite the dashing ensemble. I'm trying to be polite here:) And, hopefully, I'll be able to grow a mustache of my own!Well... I'm here about to find the most workable steps to writing a research paper. By the way, you're a great blogger!